We all walk towards it. Some of us swim headlong into its embrace with such purpose it’s almost enviable. That is, seeing such loyalty to the inevitable could seem enviable to us other creatures who try to cheat it, perhaps become lost to the grief of it. The river is thick with it. The smell of it floods into my nostrils. Carcasses strewn upon rocky cascades, coming to rest on banks of clay and worn gravel. Bodies ripped and torn and taken deep into the forest in between the teeth of bears and wolves, in the grips of the talons of eagles and ravens. Pieces of vertebrae, jaws lined with gnarled teeth, scaled skin parted from flesh and turned inside out; bits of dog salmon scattered along the river bank. A raven plucks an amber eye from the fresh-dead chum right in front of me. Death fills my senses and my thoughts as I place my feet carefully from slick rock to slippery log. This is the season for it, after all. Death, I mean. I think of my human friends who no longer inhabit their bodies, lost to previous Septembers. My state of mind is dark and I project my shadows upon the forest. The future feels heavy and the past clouds my current reality. The river is loud and I am thankful to it for drowning out my sharp and weighted thoughts. Then I stumble upon this, and time stops. 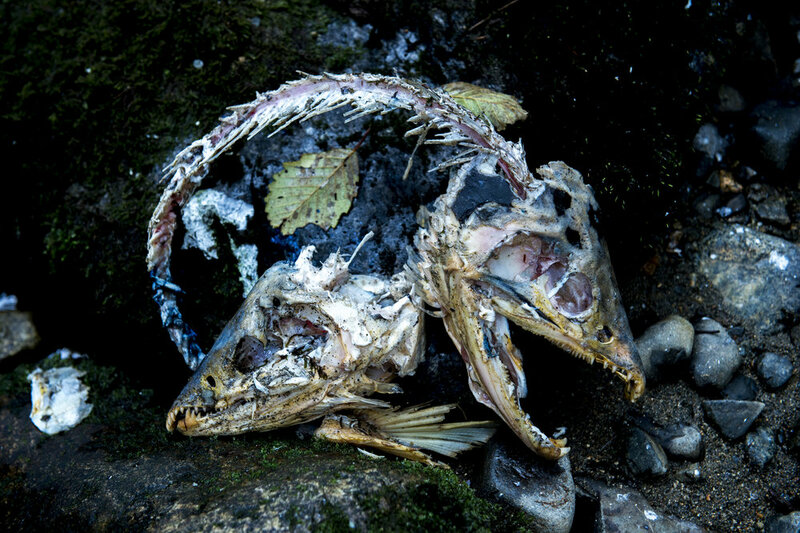 I almost trip upon the skeletons of two dead salmon, curled into eachother like transcendant lovers. I feel intrusive in my witnessing of their final embrace. I am naive in my understanding of death. How can I both fear and hurl myself towards something that carries such finality? How some days I look to it as the answer, as if it holds a peace that will extinguish the pain that this life is so saturated by. How some days I am so afraid of it swallowing those around me that I close myself off to life to try to cheat grief. How some days life is so loud that I forget about the death we all walk towards entirely. And when I am finally released from the stronghold of the moment, I find the darkness has lifted. Revealed is the same river I was walking down, but different now. I see the clay banks scarred by bear claws, all sorts of tracks in the sand, dippers flitting from one rock to the next, swooping ravens weaving from tree to tree, eagles flying in between branches just barely able to fit their enormous wingspan between the dangling lichens. The powerful tails of chum throwing water into the air as they make their way upstream to gift their bodies to their unborn children. All around me, death and life dance together. There's an acceptance and respect for this ancient relationship that permeates the air. I am humbled, once again, standing knee-deep in a small river wondering how many times the salmon will patiently and persistently open me to their teachings.